Warblers are three groups of birds which belong to the order Passeriformes (Perching Birds). The common name "Warbler" was derived from the trills and quavers of their songs. These small song birds are not closely related, but share some characteristics, as they are all similar in size, active and insectivorous. The Dartford Warbler is an Old World warbler which breeds in the warmer parts of south west Europe and northwest Africa. Its breeding range lies west of a line from southern England to the heel of Italy. It is a mainly resident breeder, but there is some limited migration. This small, 13 cm, passerine bird breeds in heathlands often near coasts, with gorse bushes for nesting. The nest is built in low shrub, and 3-6 eggs are laid. Although some populations are badly hit in hard winters, this species can recover well because of repeated nesting and a high survival rate for the young. Most warblers have an almost identical appearance for both sexes, but several Sylvia species have distinct male and female plumages. The male of this a small warbler species has a grey back and head, reddish underparts, and a red eye. The reddish throat is spotted with white. The female is paler below, especially on the throat, and a browner grey below. Like most warblers, the Dartford Warbler is insectivorous, but will also take berries. The song is a distinctive rattling warble. 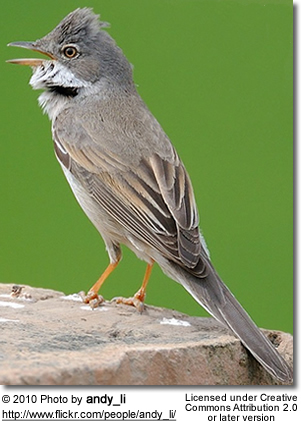 The Desert Warbler is an Old World warbler which has two distinctive forms. These were previously treated as subspecies, but are now given specific status. 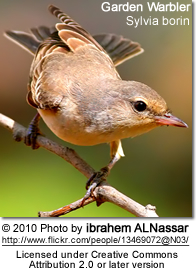 African Desert Warbler, Sylvia deserti is a resident breeder in northwest Africa. Asian Desert Warbler, Sylvia nana breeds in south central temperate Asia. This form is migratory, wintering in north easternmost Africa, Arabia and India. It has occurred as a rare vagrant as far west as Great Britain. This small passerine bird breeds in deserts and other arid environments, with some bushes for nesting. The nest is built in low shrub, and 4-6 eggs are laid. As with most warblers, the sexes are almost identical. This is a small warbler with a sand-colored back and head, whitish underparts, and a yellow eye. Like most warblers, it is insectivorous, but will also take berries. The song is a distinctive jingle. African Sylvia deserti is paler than the Asian species. The Marmora's Warbler is an Old World warbler in the typical warbler genus Sylvia. It breeds on Mediterranean islands, including Corsica, Sardinia and the Balearic Islands. The smaller Balearic race is sometimes given specific status as Balearic Warbler, Sylvia balearica. This species is mainly resident but some birds migrate south to winter in north Africa. This is a rare vagrant to northern and western Europe. These small passerine birds are found in open country with thorny bushes and heather. 3-5 eggs are laid in a nest in a bush. Like most warblers, The Marmora's Warbler is insectivorous. 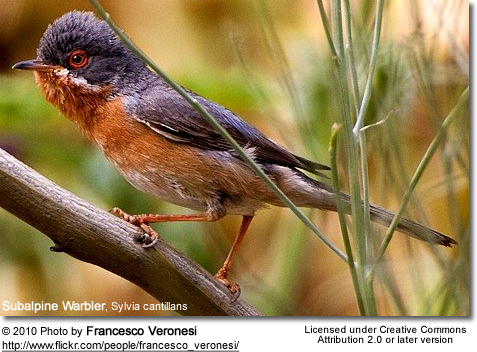 These are small, long tailed, large-headed warblers, similar in size and shape to a Dartford Warbler, Sylvia undata. Marmora's Warblers are grey above and below, lacking the brick-red underparts of their relative. Adult males have darker patches on the forehead and between the eye and the pointed bill. The legs and iris are red. The song is a fast rattle. Immature birds can be confused with young Dartford Warblers, which are also grey below, but Marmora's have a paler throat. The iris is dark. 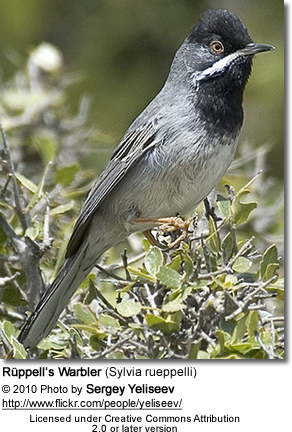 The Balearic Warbler is 20% smaller than the nominate form. It is also paler below, with a pinkish tinge. This bird is named after the Italian naturalist Alberto della Marmora.